One of my favorite types of foods to eat while in Japan is yakitori. It is a staple of Japanese cuisine and found at izakayas all over the country. While the name yakitori refers to skewered chicken, it can also mean an assortment of grilled foods including vegetables, eggs, and seafood. Tokyo has its fair share of yakitori shops including some of my favorite found at Omoide Yokocho (Memory Lane) near Shinjuku Station. For some of the best yakitori in Tokyo outside Omoide Yokocho, I head to Kushiwakamaru Honten. This shop, located in the Nakameguro district of Tokyo, is popular for its affordable yakitori and drinks. Kushiwakamaru Honten is always busy with locals having a drink and eating grilled meats. This is the type of local yakitori shop I dream of when I visit Japan. While Nakameguro is only a few minutes away from Shibuya by train, it feels worlds apart. Nakameguro is hip and trendy (for the moment). It is a highly desirable place to live in Tokyo. Those with a love for art, and food, have flocked to this neighborhood. I would call Nakameguro the Brooklyn of Tokyo. The interior of Kushiwakamaru Honten was small, though cozy. The restaurant was bright with a simple wooden decor found at countless neighborhood yakitori shops and izakayas. The wonderful aromas of grilled meats, vegetables, and a mixture of charcoal and cigarette smoke hit me the moment I walked through the door. Directly in front of me was a long square counter wrapping around a tiny kitchen. The small kitchen was the size of a closet. In this kitchen, chefs dressed in white were tending to the charcoal grill. With each order, the chefs would grab skewers of meat or vegetables from a small refrigerator, season each piece, and place it directly on a hot grill over charcoal. Charcoal is essential to great yakitori. It is what gives it that delicious, smoky flavor. It was a Friday night, and without a reservation I was lucky enough to snag one of the last seats at the counter. From my seat, with a cold beer in hand, I had the perfect view of the chefs doing their magic. It was a great experience. If possible, I recommend trying to get a seat at the counter. Next to the kitchen was a cramped dining room filled with smoke and small black tables packed tightly together. On wooden walls were coat hangers and posters listing different menu items and drinks. There wasn’t an open seat in the house. Every seat in the bright and open dining taken. The atmosphere was electric with people talking, drinking, eating, and smoking. Everyone was having a great time. For the moment, I forgot that I was a tourist. It was great that Kushiwakamaru Honten had an English menu. This was especially true for a place that seemed so far off the beaten path for tourists. There were three parts to the menu: yakitori, side dishes, and drinks. 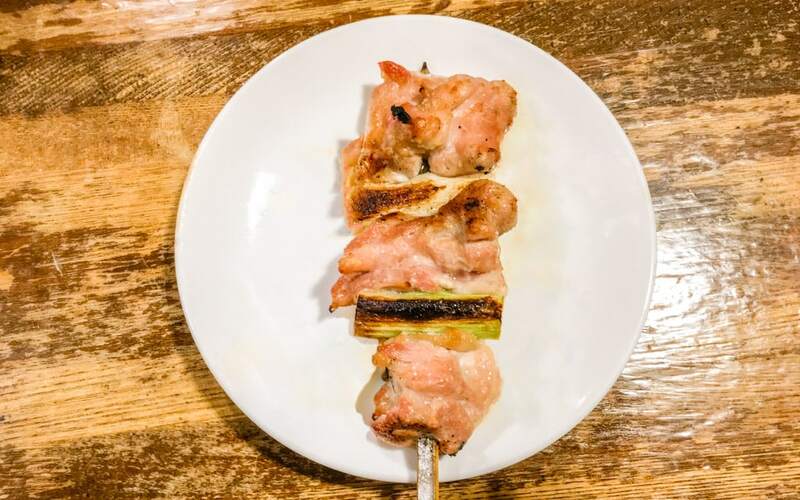 While chicken may be the main focus of the yakitori menu, you could also find other yakitori options including beef, vegetables, bacon, smoked duck, and eggs. There was a side menu which had an affordable selection of Japanese appetizers including dumplings, tofu, pickled vegetables, and a salad. The drink menu had an assortment of beers, local Japanese sake, cocktails, and soft drinks. First up was the Smoked Duck Breast (Aigamo) – (350 yen or about $3.21). Out of everything I ordered this night, the smoked duck breast might have been the largest skewer of meat. So much duck packed onto one skewer. Definitely worth the price. The duck, charred to perfection, was delicious with a salty and smoky flavor. My only complaint was that the duck was on the dry side. I would have preferred for the duck to be cooked less. Between the pieces of duck were smoky, tender, crunchy green onions (negi). These charred onions were fantastic and added a dimension of flavor and texture to each bite. The Chicken Meatballs (Tsukune) – (250 yen or about $2.30) are one of my favorite types of yakitori. These chicken meatballs were cooked to perfection and oh so flavorful. Charred and smoky on the outside while tender and juicy on the inside. I can’t think of anything worse than a dry meatball. A salty and sweet sauce was lightly brushed over each meatball. The sweetness of the sauce complimented the smoky flavors of the charcoal fire. I could eat these all day. The bacon was thin, reminding me more of ham than thick-cut bacon. Though thin, the bacon tasted like bacon. It was lightly gilled and smoky with a salty rich flavor. Hidden under each piece of a bacon was a small cherry tomato. Each tomato was juicy and tender after cooked over the flame. While this piece of yakitori was great on its own, I would have loved for some crunchiness from green onions (negi). Without a doubt Chicken Hearts (Hatsu) – (180 yen or about $1.65 yen) are my all-time favorite type of yakitori. I dream of it every time I go to Japan. Sure, chicken hearts might sound strange if you have never had them before, but trust me, they are delicious. The hearts, though small, had a great meaty texture. So much flavor packed inside such a small piece of meat. Each chicken heart seasoned with a generous amount of salt and charred to perfection. With such a small piece of meat, you would expect the hearts to be dry. But, this was not the case. The hearts were tender, almost juicy, with a slightly pink middle. No need to worry though as this is common in Japan. I only expect the best when I order chicken hearts, and these were no different. When I saw the Green Peppers Stuffed with Cheese (Chi-Zupi) – (270 yen or about $2.48) on the menu, I knew I had to order them. And, I wasn’t the only one. It seemed everyone around me was ordering them. Every component of this skewer was smoky and delicious from the pepper to the bacon to the cheese. The cheese melted into every corner of the tender yet crunchy green pepper. It had a stringy texture, reminding me of a melted mozzarella but with a smoky, salty flavor. The bacon seemed different than the type used with the Tomato Rolled in Bacon skewer. This bacon was thicker, meatier, crispier, and saltier. I loved how the bacon wrapped around the entire green pepper ensuring each and every bite was salty and crispy. The only beef item I ordered was the Beef (Gyu-Kushiyaki) – (360 yen or about $3.31 yen). Just as with the Smoked Duck Breast, there was a lot of beef packed onto this one skewer. Each piece of beef charred until crispy on the outside. It just looked beautiful. I was hoping that it tasted as great as it looked. And, it did. The beef had a wonderful rich flavor, mainly from the few bits of fatty pieces. They were the best. The rest of the skewer was inconsistently cooked. You had juicy pieces which were medium rare and pink in the middle while other pieces were dry and chewy. Either way, the gyu-kushiyaki was flavorful and I really enjoyed the rich, delicious fatty bits. Another of my favorite, the Leek & Chicken Leg Meat – Neginiku (240 yen or about $2.20). There was so much chicken packed onto the skewer. While the chicken was smoky, I wanted it to be more charred. I wanted it to be crispy and crunchy. On the other hand, the seasoned chicken leg meat was so tender that it was almost falling apart. I had a hard time keeping the chicken on the skewer. Last up was the Quail Eggs (Tamago) – (180 yen or about $1.65 yen). Each stick of yakitori had four small quail eggs cooked until lightly charred on the outside. The egg white was much thicker than I would have expected for such a small egg. It took a good bite to reach the yolk hidden on the inside. I was expecting the yolk on the inside to be runny, but this was not the case. Each rich and salty egg yolk roasted until cooked all way through. Each egg cooked at just the right temperature for the yolk to be moist and not dry. Though small, the quail eggs packed in a lot of smoky, rich flavors. The service was surprisingly efficient with how packed it was on my visit. While the servers weren’t chatty, and only knew limited English, when I needed something all I had to do was ask. Before I could blink, my food or drink arrived in front of me. You can find great yakitori shops and izakayas that serve delicious yakitori all over Tokyo. One of those places is Kushiwakamaru Honten. While I won’t argue if it’s the best yakitori in Tokyo, what I do know is that I enjoyed everything about my visit. Each piece of yakitori was delicious with the perfect hint of smoky goodness in each bite. I enjoyed the wide variety of yakitori options on the menu. Not only was the food great, but so was the atmosphere. It was lively, friendly, and enjoyable. I was fortunate enough to grab a seat at the bar, surrounded by locals. Having a cold beer while watching the chefs grill each piece of yakitori over the open flame is still something I think about. I can still remember the smell. It didn’t get much better than that. In that moment of time, while sitting in a cozy izakaya in the middle of Tokyo, Kushiwakamaru Honten seemed like the best restaurant in the world to me. There was no other place I wanted to be at that moment.